Hello there hope you are well, I woke up yesterday feeling YUKK :-( the lurgy took hold of me but I am medicating myself round the clock and I am determined not to let it spoil my family time, then my Internet went down for a whole 24 hours). Talk about being completely and utterly lost. But is all good and today is my dear Jackie's Happy Day. Jackie is one of my lovely Passionettes and she is a fabulous and very prolific scrapbooker. In fact that's how I have met Jackie on a scrapbooking retreat. So bearing this in mind here's the card I have made for her. Jackie loves red and I love those papers from the *LOVE LETTER* collection:) a lot! !> I also love the Notably Ornate stamps. Basic Black, Real Red and Very Vanilla gives you such an easy and elegant combo. The sentiment comes for the Perfect Punches and the monogram from the Broadsheet alpha stamp set. You know what's even better? the fact that those stamp sets were absolutely free. I earned them for free like most of the stamp sets I own, I love being a demonstrator and if you love free stamps and [product you too could become a demonstrator and start a new venture in the New Year. I am looking to build my team and would invite you to join me if you are thinking about it. Read more here then get in touch for more details and a no obligation chat. 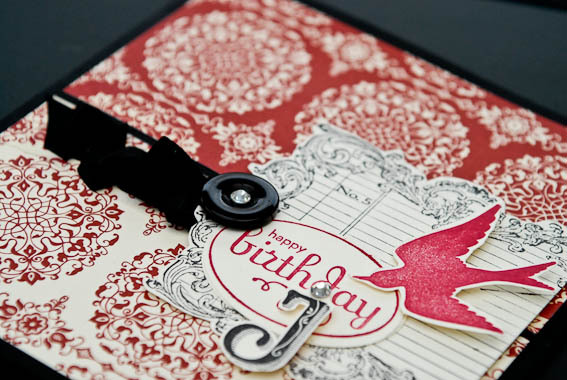 Here's a close up of the accents on this card all grouped together. I added a black button topped with a clear rhinestone as well as using one of those blingy stones for the monogram. Black satin ribbon has been added as well. 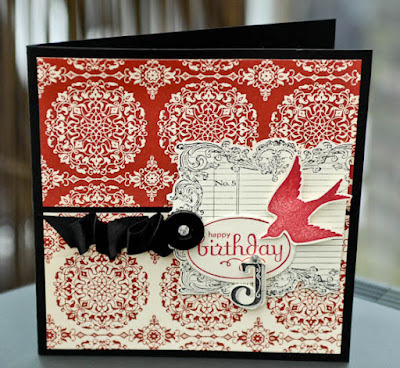 Jackie I hope you had a fabulous day and my card got to you in time. Glad you are feeling lots better, You and Pete have a great Christmas..
wow-love this Monica. Tre elegant.